If you’ve suffered from hearing loss, you know how frustrating it can be. The TV is always being turned up louder, you can’t hear your friends at a get-together, and you struggle to hear your loved ones and ask them to repeat themselves over and over. It can be an emotionally and physically draining experience. 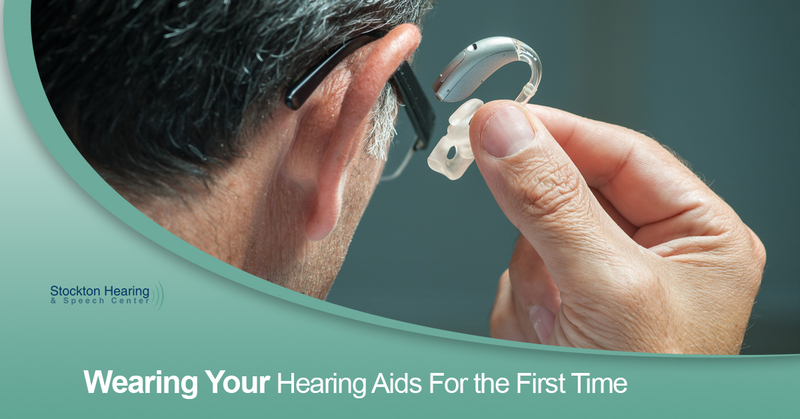 So you can imagine the relief you might feel when you first wear your hearing aids. But for many, using a hearing aid for the first time can lead to new experiences beyond just hearing again. With 40 years of experience in hearing and speech practice, Stockton Hearing & Speech Center are the experts in hearing aid evaluations and fittings. Contact us today to see how we can help. If you’re using a hearing aid for the first time, it can raise a whole wash of emotions in you. But for many, the first thing they feel is confusion. Many people who receive a hearing aid have suffered from gradual hearing loss over the course of several years. They may not have noticed this gradual change until they had their hearing evaluated or a loved one expressed their concern. When first wearing your hearing aid, we suggest keeping these things in mind. When looking at the styles of hearing aids, many people draw comparisons to other accessories they’ve used in their life. Behind-the-ear styles, with their slight wire or tube that wraps around the back of the ear, is often compared to the earpieces of a pair of glasses. The in-the-ear aids are seen as akin to ear plugs or ear buds. While they might look similar, they feel very different. They might feel odd at first, as they put weight and pressure on parts of your ear that have not experienced that sensation before. To mitigate these new feelings requires practices. Start by wearing your hearing aids for just a few hours each day. This allows your ear to adjust to the feeling of having them in and allows your brain the chance to adjust gradually to more sound. If you wear them for a while, but start to feel tired or overwhelmed, feel free to take them out. The next time you put them in, try and wear them for a while longer. You’ll begin to get used to identifying sounds, and the sensation of having them in your ears. Additionally, the feeling of hearing clearly might be odd at first. Your brain will need time to remember how to hear, identify, and interpret the myriad of sounds that occur in daily life. We always encourage those who have just been fitted for hearing aids to take a few minutes when they arrive home and sit quietly. Take this time to observe the new sound quality your hearing aids provide you. Ambient sounds that have faded from your observation due to your hearing loss might suddenly come roaring back to your attention. Spend more of your time in quiet spaces as you grow used to having a greater range of hearing back. You don’t want to overwhelm your brain and yourself by immersing yourself in sound and noise as soon as you get your hearing aids. While you might be thrilled to hear the melodious tones of a humming refrigerator again, you might find that the clock hanging on the wall is ticking louder than it should. Keep a hearing journal handy, and during the first week or so of wearing your new hearing aids, keep track of the sounds that are too loud, or not loud enough. You can bring this journal with you to the audiologist during your follow up appointment. They’ll be able to adjust your hearing aids properly so that the sounds you’re experiencing are more balanced and nuanced. This may feel like a funny thing to think about, but is an important part of getting the most out of your hearing aids. Hearing loss changes the way you respond to sound, both in your understanding of that sound and your reaction to that sound. We’ve found that a great way to practice these skills is to watch a TV show with the closed captioning and the sound on. That way you can hear these sounds, and begin to associate them with words and speech patterns. We’ve also found that reading along out loud with an audiobook is helpful in speeding up the hearing aid adjustment process. This can often be the most difficult part of wearing hearing aids for the first time. Being patient with the hearing aid adjustment process will make the whole process easier for your, your family, and your audiologist. You’ll grow accustomed to the way the hearing aids feel and to all of the wonderful, beautiful sounds you can now experience again. If you feel you or a loved one would benefit from the use of hearing aids, contact Stockton Hearing & Health. We’ll schedule you for an evaluation to ensure that hearing aids are the right hearing loss treatment option for you. We’ll take the time to make sure you are fitted for a hearing aid that addresses your level of hearing loss and is suited to your lifestyle. Reclaim your sense of hearing, contact us now.